Several years ago I was in Glasgow visiting with family. We went out to a restaurant and I ordered a Famous Grouse. When the server returned, there was ice in the glass. I asked my host, "Did I ask for ice?" His answer was direct and simple, "It was your accent!" I added a PVC drain to the tank. I created a sandwich to allow me to get a fully insulated seal around the container and still be able to have several inches of unbroken insulation above. 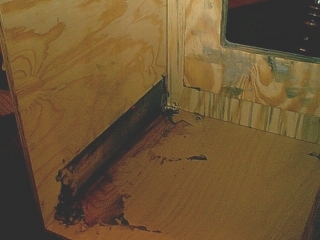 Note below that the inside corners have been faired (not shown: then taped and epoxied). 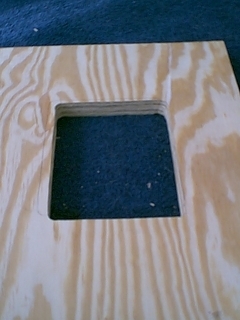 You may be able to see how the nested plywood permits the addition of a layer of foam between the smaller section to which the container is attached and the larger top piece which serves as the inner lid. 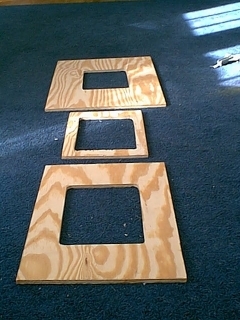 The picture on the right shows the inner lid in place. Two inches of rigid styrofoam go above this to give 3+ inches all around. More would be better, but space limitations will not allow more. The box is to occupy a portion of the berth abaft of the galley sink, if you are familiar with the layout of the older Westerly designs. 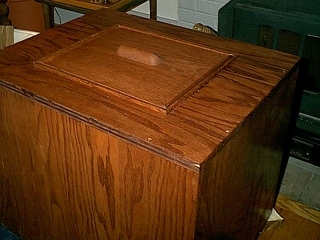 The side of the icebox, therefore, will become a back rest for the chart table. 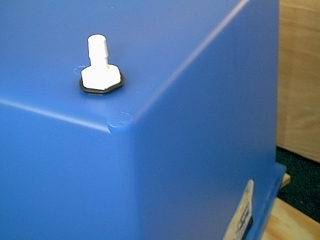 Here the blue container has been screwed to the sandwiched GRP (I'm turning into my Scottish self again!) 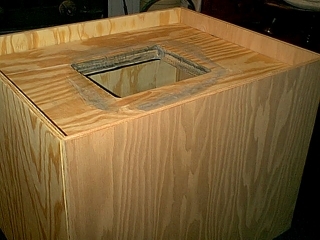 I foamed between two plywood layers before adding rigid styrofoam. Note the foil liner that I added as a reflective barrier. I laid it over the wet epoxy. 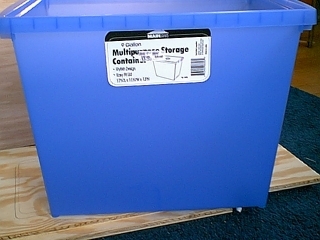 I placed a layer of sheet vinyl between the inner lid and the insulation to assure a smooth surface. 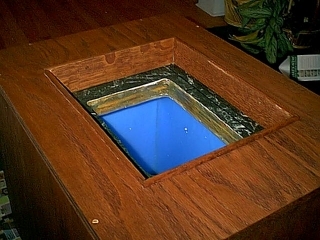 The lid is a box with an oak drawer pull, filled with rigid foam, and epoxied with fiberglass mat. I used mahogany stain to match the laminate of the bulkheads and galley. 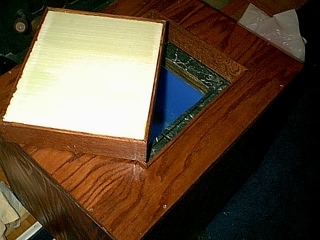 Below is the finished box minus the trim which I will install in the Spring when I commission the boat.